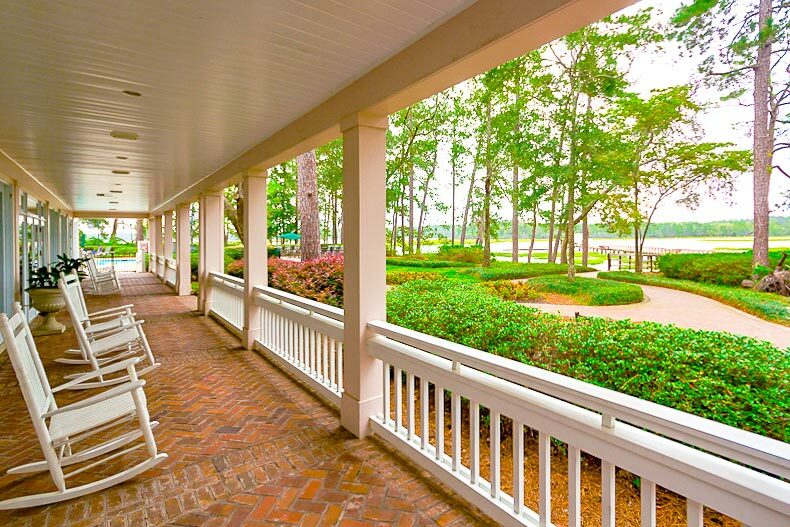 Sitting on the porch of Sun City Hilton Head's clubhouse overlooking the water is a pretty good way to spend the day. The striking beauty of the South Carolina coast is undeniable. Pair that with its rich history, charming coastal towns, a wealth of activities, entertainment, and cultural amenities, and you’ve got one of the most desirable locales in the country for active adults to settle down. Luckily, there are several options when it comes to buying affordable South Carolina real estate, whether you’re looking for a second home or a permanent residence. Here are four communities in coastal South Carolina with homes for sale under $200k. Originally built in 2006, the Abbey Glen community features a combination of 112 single-family and attached homes that are available as new construction or on a resale basis. Prices range from around $200,000 with a number of collections to choose from. Attached homes in the area are ranch-style with three different models to choose from. Living space ranges from 1,325 to over 2,600 square feet and can have up to three bedrooms, three bathrooms, and two-and-a-half-car garages. There is one model for single-family homes and its floor plan offers approximately 2,280 square feet of living space. Amenities within the community include a clubhouse, multi-purpose room, billiards, and catering kitchen. Residents who want to maintain a fit and active lifestyle can take full advantage of the development’s fitness center and the outdoor pool on warm days. For a relaxing evening, homeowners can visit the screened lanai that provides the perfect space to unwind by a warm fireplace. Abbey Glen is conveniently located near Hilton Head, giving residents easy access to several beaches and the island’s historic downtown area. Lakeside Crossing, located in Conway, is another active adult community along the coast with plenty of real estate under $200,000. Single-family homes within the community range from less than $100k to the high-$100s and are available on both a new and resale basis. The age-restricted community offers residents plenty of places to socialize including the neighborhood’s clubhouse, hobby and game room, ballroom, and the on-site pub. Or, they strike up a little friendly competition on one of Lakeside Crossing’s many athletic courts. Staying fit at Lakeside is easy as it boasts a fitness complex with state-of-the-art cardio and weight lifting equipment, and aerobic and dance studio, plus, an indoor pool. Outdoors, residents can stay active by working out on the walking and biking trails or strolling around the scenic lakes and ponds. Myrtle Beach Golf & Yacht Club is an established, gated-community that was originally built in 1985 and is home to 1,024 single-family residences that are available as resale only. Houses were built by several different builders giving homebuyers a wide array of choices when it comes to the look and feel of their place. Sizes range from 1,100 to 1,800 square feet with two to three bedrooms and one to two bathrooms. Notable amenities include a community center, multi-purpose room, outdoor pool and spa, two shuffleboard courts, two tennis courts, a picnic area, walking and biking trails, plus, R.V. and boat parking. There’s also a playground for grandchildren to enjoy while visiting. This large gated, age-restricted community is home to over 8,000 homes with prices starting as low as the high-$100s. Sun City Hilton Head is made up of a mixture of single-family homes and attached residences built by Del Webb with several dozen floor plans for buyers to choose from. Options include 1,000 square-foot villa townhomes and single-family homes that span up to 4,000 square feet of living space. The popular development has an extremely long list of amenities that includes a 45-acre town center, multiple on-site restaurants and grills, computer room, and book exchange. Socializing is a breeze in Sun City with multiple event spaces that include a 17,000 square-foot social hall, grand ballroom, card room, and picnic pavilion. Creatives and artists within the neighborhood can spend their days creating works of art in Sun City’s ceramics and art studios, sewing room, photography studio, and woodworking shop. There are also multiple fitness centers, two indoor lap pools, four outdoor pools, an aerobics and dance studio, plus, almost 40 athletic courts that range from tennis to pickleball and bocce ball for residents to enjoy. Outdoors, residents will find walking and biking trails, a 20-acre fishing lake, dog park, gardening plots, and a playground for grandchildren.